PARIS--(BUSINESS WIRE)--The CNIM Group's Motorized Floating Bridge (PFM) is a solution dedicated to river and similar type of crossings, in service in several armies, in France as well as in Italy, Switzerland and Malaysia. With two possible configurations, bridge and ferry, the PFM offers a sure tactical advantage: it can be deployed easily, in a short time and with a minimum of men; it does not need auxiliary boats and enjoys recognized reliability on land. The implementation performance of the PFM remains unmatched today. Respond to new support needs for forces in external operations. Now air transportable, the PFM will be able to deploy rapidly to theatres abroad. New short ramps, incorporated in the modules will allow the construction of a ferry from 2 modules, for a carrying capacity of more than 40 tonnes (standard MLC40 vehicle). Finally, personnel on board the prime movers will now be under armoured protection. Provide the PFM with a new logistics transport capacity: a droppable tray system implemented from PFM trailers will facilitate ease of use and deployment. With a unique control system, a doorway consisting of 2 modules can be controlled by a single operator equipped with a wireless control console. In addition to reducing the headcount required for implementation, this innovation gives the PFM an additional advantage for rapid crossing, especially at night. With this new version of the PFM, CNIM offers equipment best suited to crossing requirements worldwide: reliable, robust, easy to implement. The first modified equipment will be delivered to the Army in mid-2019. * The Neptune Plan is part of the work of planning and anticipating the next hundred-year flood of the Seine. Its objective is to allow the flood waters to rise, then to establish a joint force of 10,000 men likely to be committed from the first effects of the flood onwards. 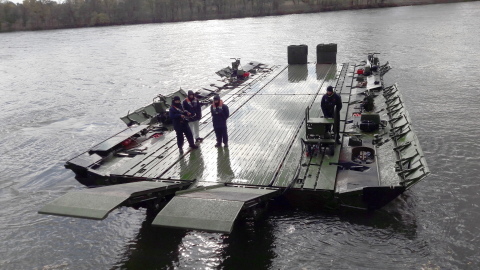 CNIM presents a modernized version of Motorized Floating Bridges for the French Army.